A few words about crafting. There are certain skills you really should have if you want to HQ stuff. In checking your Lodestone I can see that you don't have access to Byregot's Blessing, Hasty Touch, Comfort Zone, Tricks of the Trade and Steady Hand 2. The first 2 are pretty much necessary to HQ without relying on the luck of rng. Advice to you it level up the other crafters to cross class these skills, then find a rotation that works for you. The higher level you get, adding Manipulation, Innovation and Piece by Piece are useful/helpful as well. Colette wrote: Congrats on all your achievements. Well not to say that having those skills won't help but increasing HQ overall got like x3 as hard. Even as a level 50 crafter doing the 50 stuff I had I wasn't having this bad of a time trying to get HQ for the same level using that levels gear. I could at least get to 50%. Like overall the difficulty on getting HQ spiked up. Also I have the specialist actions and I may not need to grab Byregot's Blessing since I can learn Byregot's Miracle which works similar but has a slightly lower success rate (by 20%) and doesn't increase as much with each stack (only 10% not 20%) but at the same time it only halves the stacks, it doesn't consume them all. It also has a lower CP cost. So I could get a bit more use out of it if I can use it right. Of course all the other abilities would help although currently I am not into the mood of leveling other crafters. Done too much crafting in the last while and want to take a bit of a break from leveling it. Only crafting I have been doing has been to make some gil and such for gifts and the thought of a house. When armed with a full set of skills, crafting doesn't get tough until lv 58 or so, and really that's just because of fewer good procs, which especially for the 35/40 dur stuff means fewer quality attempts as you can't do an extra manipulation. Personally I don't know what the specialist actions entail as I haven't had a need to stray away from what's available at lv 50. It doesn't take long to get hasty touch and tricks of the trade (lv 15, come on man :p), and even to steady hand 2 won't take long now. It sounds like with specialist you have some other form of byregot's you can use, and with good cp food you would be fine without comfort zone. I think rapid synth is also a lv 15 cross, which will lead to generally fewer progress steps, which means some extra quality steps in your crafts. Innovation will buff your byregot's move but involves getting a class to 50... optional. Been a while since i posted anything, haven't really felt the drive to do much of anything in-world this past week either. The Novus is currently sitting at Indistinct, i finally got a 50 crafter not too long ago, thats about all I've accomplished recently. Since my last post a lot of things have happened in game. I have gotten my Astrologian sleeves and pants. Slowly getting the full look. I also have successfully gotten blue scrips and bought my weaver 3 recipe book and made 3 orders of the Thavnarian top. One for Gale, Sapphy and Tahla. I have done both of events now and got all the rewards possible. I also have helped Sapphy get her relic up to Modest level for the nexus step. I have also finally moved into my new house. Everything is still everywhere in my room but my table and tv are set up which is all that matters out of my stuff right now. Soon my summer break will be over and I will return to college but until then I am going to have as much fun as possible. Didn't do much the past few days. Helped tahla beat HW story. Farmed tomes having almost all of my AST armor apart from the belt. Then I will nab the accessories. The only major achievement I got this week was finally upgrading from Novus to Nexus. Next week, I start progression towards the Zodiac weapon. Also, I do plan to pick up Miner again, so if anyone needs a rock or ore dug up, don't be shy to ask and I'll see what I can do. Whew, it's been awhile indeed. So much to catch up on. First, i beated HW main story not to long ago and am working on my laws(Oh the pain) and on the side Eso. Though i dont see the point in the EX roulette since it gives less eso and i think less laws than the last two dungeons. Maybe its for other things such as money, not sure. Currently, i'm ilvl170 which is nice because i finally ran Alexander. It really doesn't feel like a raid or anything. It's rather short, so I'm a bit disappointed. Have yet to run the 4th floor so maybe it's better than the previous 3 floors. Maybe the Savage runs would be better? Not sure since god knows what kind of ilvl i need to even get to that. On another note, i'm currently trying to get my BTN to lvl60. Just got my miner there, but not sure what to do with it. Scripts seems like it will be a tough grind since i dont exactly have the greatest gear to even achieve anything nice. Guess i'll make a few attempts at it and work on it. Currently im just mining and selling stuff as a side thing until i find a better use for it and until my crafting classes catch up to it. Lastly, i regret not getting all of my crafting classes to lvl50 before HW came out. It's been rather tough crafting since you need so many high level items to even craft these new recipes. So I've been grinding out my crafting classes. Kinda burnt out on it so i took a break and have yet to really work on the new stuff for HW. So i just decided to get my other crafting classes to lvl50 first in hopes that it'll make things easier on the long run. Buying things on the MB is just way to expensive and i'm way to poor for that. Other than that, the game has been good to me. It's been rather fun and enjoyable. Though i hate the grind, it's rather rewarding. Now...if i can just get that hard roulette done, things would probably be easier for Laws. Alas, who knows when i'll do that. Guess i'll run my BLM on those HM dungeons to get the roulette so i can play with Aster and his DRK. Chee wrote: Though i dont see the point in the EX roulette since it gives less eso and i think less laws than the last two dungeons. The reward for ex is available once a day, and is in addition to what the 2 dungeons already give. So entering those dungeons via ex means you get 75 eso total. The timer resets daily at 15 GMT. Just been doing some Tome farm these past few days while I was awake. I have been having sleep issues now. So I am only getting on when I can and when I am not doing work. Which is becoming more and more of an issue. I may spend a week or so trying to get this fixed because I am not doing myself any favors. 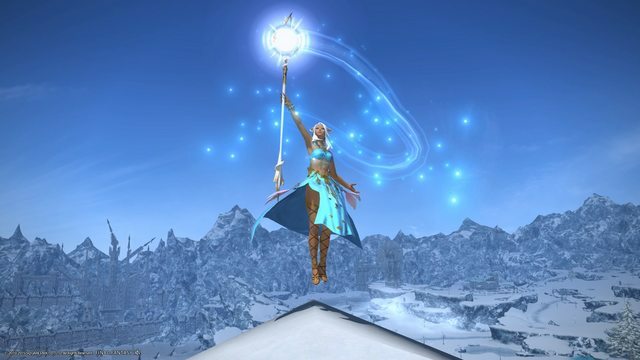 But the good news is beginning this week I am getting my Esoteric accessories as a healer now. That is it. Well with college back in session I haven't gotten as much time to play. I have been when I get the chance but most of the time I am handling assignments and projects now. This program actually requires me to think. That is a first. So basically I have gotten tomes and such along with helping Sapphy with what she is doing (relic, story) on top of helping out people when they need it and I can provide it. Well... seeing as the 3.1 patch is, so i've heard, less than a week away , it would seem i have indeed failed both of my goals, these being getting my Zeta weapon, and finishing 3.0 main story before 3.1. On the flipside, i did get Lillianne prepped for... i think it was field exploration XVI? I don't remember exactly, anyway, i also brought Paladin to 56, gained the 56 skill for it, stashed a few green 50+ weapons for later, and I'm finally starting to make a sizeable amount of gil. Just been messing with the new content. I got an accessory from the Diadem (210) that is better than the Esoteric gear. Not only did the stats go up, I got a 4th stat on it unlike the Esoteric gear. I think it is worth grinding there for gear. Since it has the pink background the stats can not only vary but it isn't unique so you can get more than one for things like rings. The gear itself shares the same design as the emperor's new look set but is already glamoured to something random so if you want a certain look all you need to do is glamour. It's been a grind but I've finished my first Anima! It took 11 days for this one. I love the design of it, I love the design of Lem's axe even more. We've already started on our second ones, Ninja for me and Monk for Lem; and yes, there will be a third one as well. Before the patch hit I managed (by 2 weeks) to get all my classes, combat, gathering and crafting to 60. 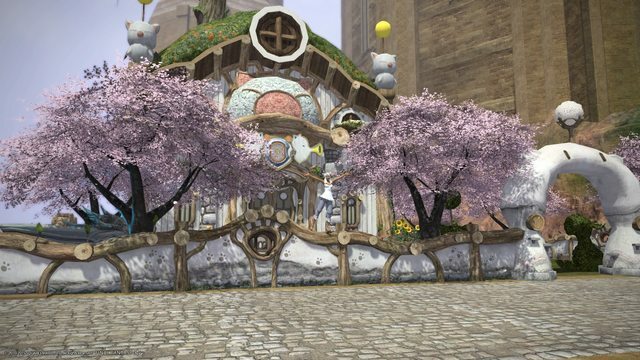 We've been doing a lot with our airships as well and with careful planning and a lot of luck, I was able to craft my very own moogle house. It was a lot of work but so worth it. There have been so many other things going on, mounts and minions and cool gear and awesome battles; I could post hundreds more pictures, but I won't (at least not today). So what has everyone else been doing? 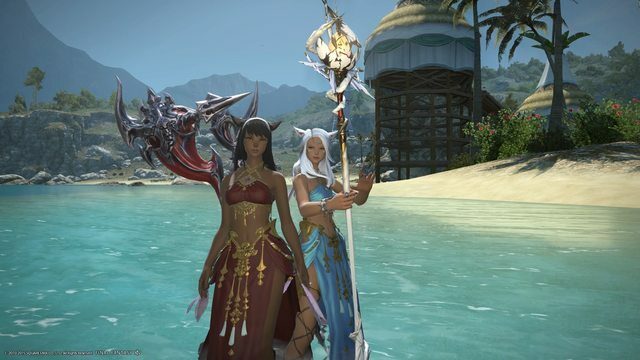 What kinds of fun are y'all having in Eorzea? Congratulations on getting the Anima. I am slowly working my way there, along with managing other characters as well now and helping out Sapphy every once in a while (when she is on and not on work basically). Got a Dark Knight to 60 and beat the story on the malboro server and I can say I have been enjoying the Dark Knight Class and the style I play it as. Just been gearing up my AST and WHM with ESO gear and doing the Vanu Vanu quest line. Been a lot of fun along with the new side story about the books and scholarly stuff.